The RF3000 and RF 6000 RF Synthesizers (immunity test controllers) include a signal generator matched to the RFI immunity requirements of IEC61000-4-3. Features such as sine and pulsed modulation, programmable start and stop frequencies, frequency step, and dwell time are provided as standard. PC controlled signal sources fully meeting all requirements for IEC61000-4-3 and featuring automatic scanning to pre-programmed schedules. Â· Field probe input for automatic level control. Â· Standard IEC61000-4-3 tests pre-programmed. All include powerful Windows control software with USB port interface. When used with the LaplaCell range of test cells, these synthesisers provide full automatic control of field level and all that is needed to provide an automated compliance test facility. Advanced features such as prescanning, display of EUT status against applied field level and full Windows compatibility are standard. 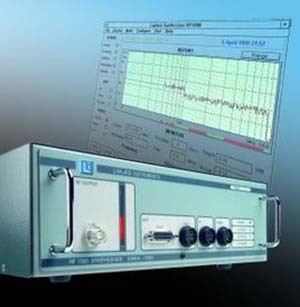 These synthesisers also have all the facilities required for test chamber applications, with an optional RS232 port specifically provided for remote probe connection. EUT MONITORING Real time monitoring and logging of EUT status facilitates accurate recording of test progress and reporting. Flexible EUT status response modes allow unattended testing for greatest productivity. RESULTS The frequency, field strength and EUT status can be plotted in real time on screen to show how the product is performing. At the end of the sweep, the plot can be saved and printed as part of the results documentation. AUTOMATION. The RFx000 can automatically perform standard IEC61000-4-3 scans. In addition the user can enter custom sweeps with flexible step size, dwell time, modulation and field strength. CONTROLLABILITY. The software also provides a powerful tool for specific product investigations. The single frequency mode can search out any weakness with automatic field strength ramping and fine control of frequency. It includes facilities to load calibration data for the test cell, field probe or CDN as appropriate.